Behavior Blocker: To catch zero-day threats that aren’t yet included in the signature database, Emsisoft Anti-Malware continually monitors the behavior of all active programs and raises an alert as soon as something suspicious occurs. Combined with the live cloud-verification of the Emsisoft Anti-Malware Network it is our ultimate weapon against specialised and sophisticated malware attacks that others can’t protect you from. Don’t rely on freeware antivirus programs. They usually only provide a scanner to cleanup the mess after the worst case scenario has already occurred and the PC is overrun by malware. You would rather be PROTECTED, wouldn’t you? We presume that you would also prefer to receive personal assistance in emergency situations instead of being forced to fill out an anonymous support form, from which you might get a reply three days later, if at all. 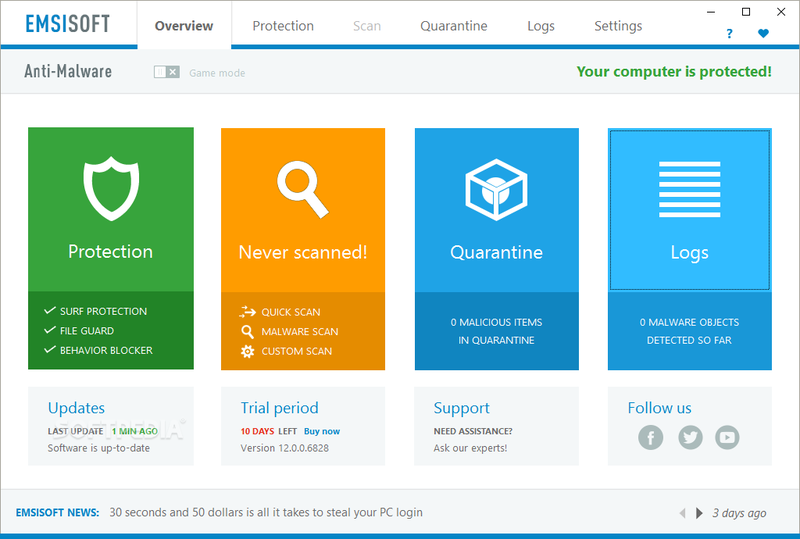 That’s why Emsisoft is a Premium software for premium customers – and includes a malware removal guarantee.